Tuesday night saw the Jackets taking the trip to Athens to rekindle the state’s biggest rivalry as they took on the struggling Georgia Bulldogs. Evans was once again the story from the plate and on the mound as he went 2-for-4 with three RBIs and also pitched a perfect ninth inning to pick up his third save of the season as the Jackets held on for a 7-5 win. After trailing 4-2 after four innings, the Jackets responded with three runs in the fifth as Brandon Thomas, who returned after a nine-game absence due to mononucleosis, hit a two-run double to tie the game while Evans gave the Jackets the lead after an RBI single. 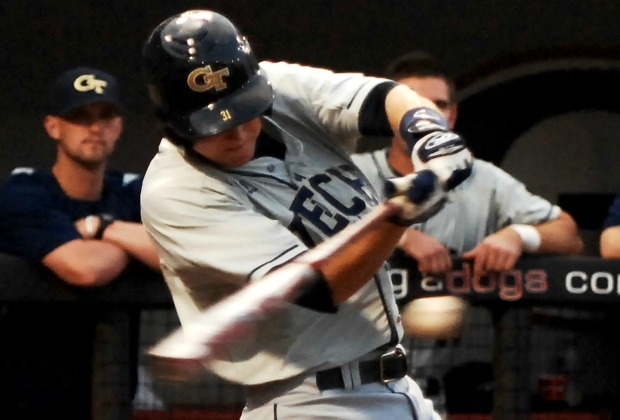 The Jackets (24-9) fended off multiple Georgia comeback attempts, as the Bulldogs (12-22) had runners on the corners in the sixth with one out and couldn’t cash in as Tech responded by turning a potentially troublesome grounder into a 6-4-3 double play to end the side. Georgia then loaded the bases in the seventh with no outs but could only squander one run as Jackets reliever Alex Cruz was able to minimize the damage after a strikeout, sacrifice fly and catching a runner stealing. After splitting a pair of games against in-state rivals Mercer and Kennesaw State last week, the Yellow Jackets made their way to Durham, N.C., for a three-game series against the Duke Blue Devils over the weekend. The theme of Friday’s series opener was missed opportunities for the Jackets, who left 10 runners on base in a 2-0 loss to the Blue Devils. Despite another strong outing from Buck Farmer, who went eight innings and allowed two runs on six hits, he couldn’t get any run support as he lost his first decision of the season. The team did get a 3-for-4 outing from freshman Matt Gonzalez to spark a mostly-stagnant offense. Saturday’s Game 2 was yet another low-scoring affair, but this time in the Jackets’ favor as Thomas King’s RBI single in the eighth inning gave the Jackets the lead for good in a 2-1 victory. Dusty Isaacs, who was named ACC Pitcher of the Week, went 5.1 innings allowing a run on five hits but was unable to get the win. Jonathan King picked up the win after 2.2 innings of relief, as he retired seven of eight batters faced. Zane Evans, who has become a force at the plate and on the mound, was able to earn his second save of the season and the ninth of his career. The Jackets’ offense had struggled to put runs across the plate throughout the series and the rubber game continued that trend as Duke got a complete game from Robert Huber, who shut out the Jackets 3-0. Huber allowed five hits and struck out seven en route to his fifth win of the season. For Tech, Cole Pitts lasted just five innings, surrendering three runs on five hits. Kyle Wren’s ACC-leading hitting streak ended at 20 games as he went 0-for-4. Zane Evans and A.J. Murray each went 2-for-4 as the lone bright spots for the offense. Tech returns home this weekend for a big three-game series against the fourth-ranked Virginia Cavaliers, who currently sit in second in the Coastal Division, with a 12-3 conference record, along with a staggering 30-3 overall record. A series win puts the Jackets back in contention for the division title with just under half of the regular season to play.